The Leadership Fellows and Alford Community Leadership & Involvement Center are proud to offer Stretch!, a day of leadership and physical challenges via ropes and challenge course initiatives. Stretch! is a fun and challenging day! We will begin on-campus where we will introduce the leadership concepts that we plan to focus on and watch a powerful TEDx video to set the stage. At Summit Vision, we will learn all of the necessary safety procedures for being part of a high ropes course. Then, it's up in the sky for us as we move our way through a series of exercises and challenges. 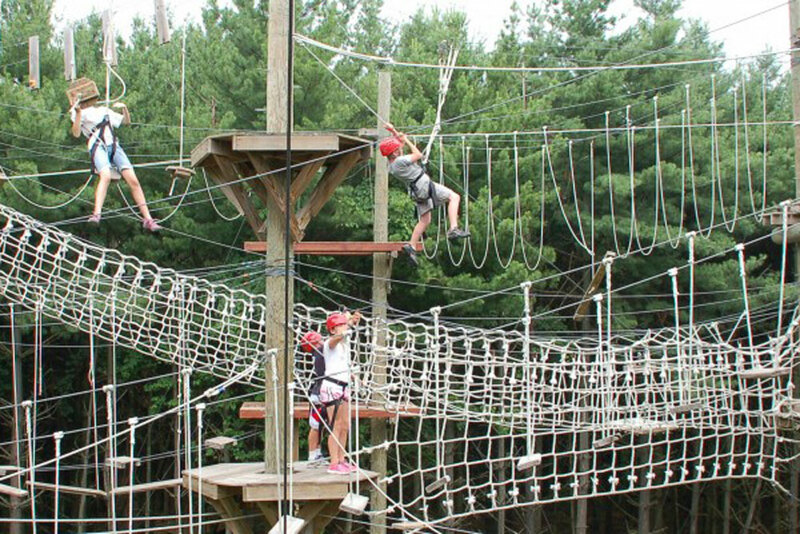 Participants will travel to Summit Vision in Westerville, Ohio and have the opportunity to challenge themselves with low and high ropes courses. Participants will travel to and from Summit Vision and receive lunch. How do I apply to participate in Stretch!? What are the requirements of Stretch!? Stretch! is intended for all Denison students interested in challenging themselves physically and mentally through ropes and challenge course activities. Participants must be available the entirety of the program. Stretch! participants will be asked to submit a commitment form, travel release form and Summit Vision release form upon acceptance. All of the activities and challenges are challenge by choice, so if something is uncomfortable or out of a participant's comfort zone, s/he does not have to participate. Stretch! is FREE to all students who are selected and attend the program. Participants will be asked to submit a Commitment Form signifying their commitment to attend. Should a student that submits this form fail to do so, his/her student account will be charged $50. Stretch! participants will receive lunch and transportation free of charge. When is Stretch! and where is it located? Stretch! is April 10. Participants must be available for the entirety of the program. Stretch! will be held at Summit Vision in Westerville, Ohio. Participants will receive travel to and from Westerville. All participants should wear closed toed shoes and be prepared for the weather—rain or shine! If your group is participating in a high ropes or high elements experience, all participants should wear a shirt that is long enough to tuck in & no short shorts! Feel free to contact the Leadership Fellows (leadershipfellows@denison.edu) with questions.